By Roch Thornton, CAP 2-7-2, 1970-71I don’t remember who started it, but CAP 2-7-2 fell into the practice of giving C-rations to Vietnamese civilians who brought us dud ordnance they found in the countryside. It was a way to instantly and anonymously reward people for performing a valuable service. After years of warfare, South Vietnam was littered with artillery and mortar shells that fell to earth but failed to explode. Many Viet Cong booby traps were made of these duds. 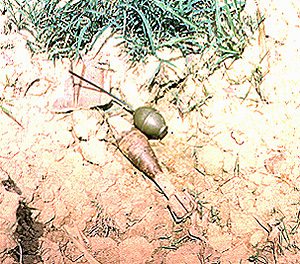 Charlie collected the shells and either dug out the explosive or simply drilled out the detonator and inserted his own. It was painfully ironic that Americans were being killed by shells stamped Made in the U.S.A. Collecting and destroying dud shells denied Charlie the pleasure of using them against us. I took this photo showing how I used a grenade to blow up a dud 60mm mortar shell. I removed the grenade fuze assembly and inserted a blasting cap crimped on the end of 6-8 inches of time fuze. The green time fuze sticking out of the grenade would take about a minute to burn, giving ample time to walk away before the explosion. Most duds were found by Vietnamese peasants in their day-to-day digging, plowing and planting. They found all kinds of stuff, from single bullets and grenades to 155mm artillery shells. It was fairly common for our PFs to lose items such as rifle magazines, grenades and cartridge belts. No doubt Marines lost some stuff, too.Anyway, some civilian turned something over to a Marine in CAP 2-7-2 and was given a box of C-rations as a reward. The word got around. Then another civilian turned up with something and stood there until he got C-rations, too. Pretty soon, turning over dud ordnance to the Marines became a cottage industry in Thanh Quit. People of all ages found stuff to hand in. The oddest item was a rusty, 8-inch artillery shell with Japanese (I think) ideograms stamped into the base. If the shell WAS left over from the Japanese occupation, it was at least 25 years old. It made a nice, loud ‘BOOM’ when I blew it up. A box of C-rations sold for about $1.50 in the Thanh Quit marketplace. Vietnamse peasants were lucky to earn $150 a year from their small plots of land. A farmer who found a couple of grenades could give them to the VC for free, or earn a week’s pay by taking them to the Marines. No contest. For handing over a single bullet, we might give a kid a small can of peanut butter or a C-ration packet of four cigarettes. He would get a whole C-ration meal for a grenade or a magazine full of M-16 rounds. A dud 81mm or 105mm shell was worth an entire case of C-rations … 12 meals worth $18. It was a triumph of capitalist enterprise, and all we had to do was order an occasional extra case of C-rations from CACO 2-7. As the demo man for CAP 2-7-2, it was my job to blow up the dud ordnance we received. It was fun. I put the dud shell in a crater or ditch, attached a small charge made of C-4, lit the fuse and walked away. KABLOOEY! Chunks of dirt and hot pieces of shrapnel rained all around. It was much better than setting off Black Cats on the 4th of July back home. Since I blew up dud ordnance, it gradually became my job to receive anything turned in, and dole out the reward. I kept track of these transactions in a small notebook. At first the stuff trickled in, but in June I recorded 48 items. It became obvious that people were coming from long distances to turn stuff in and claim a reward. Maybe we were paying too much, or maybe we were the only unit paying anything? When I opened the bag, a chill ran down my spine. Inside were three 105mm high explosive shells — like bullets two feet long and five inches thick. The detonators on the tip of each shell were crushed and deformed by impact. Papa-san was nonchalant about the explosive power he dropped at my feet — enough to tear us both into bloody shreds. He probably figured the shells were safe because they hadn’t exploded when they screamed into the dirt at a thousand miles an hour. I wasn’t so sure. I nervously ordered the old man to move the shells to a nearby piece of waste land and went to get my demo gear. I blew up the shells and the old guy went away delighted, with three cases of C-rations on his back, equaling four months’ pay. Quite a harvest. Word of our little enterprise eventually worked its way up the chain of command and orders came down to end the exchanges. No explanation was offered. But everybody recognized the value of getting unexploded shells out of circulation. Unknown to us in CAP 2, a plan was already in place to pay cash instead of C-rations for dud ordnance. They called it the VIP program for “Voluntary Information Payment.” As always, the problem was the paperwork. Under the VIP program, we were given forms to fill out when dud ordnance was surrendered. Instead of getting C-rations on the spot, papa-san was told to come back in a week to receive cash. The paperwork was sent up the chain of command to company then 2nd CAG headquarters, where cash was issued and sent back down the chain. Sometimes the process took a week, sometimes it was two weeks. One man came to see me three weeks in a row before his reward money finally arrived. Needless to say, all the fumbling destroyed the system. People stopped turning in dud shells, sick of providing their names to a faceless bureacracy, then waiting uncertain weeks for a reward. No doubt some of those shells became booby traps and Marines were again killed by homegrown explosives. Another fine example of “fixing” something that wasn’t broken.